ELIMINATE COSTLY AND POTENTIALLY DISASTEROUS CONCEPUTAL ERRORS IN YOUR NEXT STRUCTURAL DESIGNMake sure your next building project is free of the conceptual errors that can cause structural failure with McGraw Hill's Building Anatomy: An Illustrated Guide to How Structures Work. Packed with a wealth of informative diagrams and illustrations, this essential volume drills deep into the concepts behind structural systems to give you a critical understanding of how they work. From potential loads, load combinations, and superstructure to lateral support systems, foundations, and site soil and geology, Building Anatomy can help you design structures that will stand the test of time. 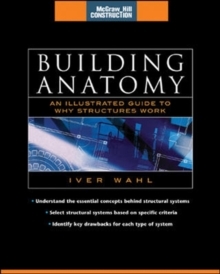 Written in clear, easy-to-understand language by an award-winning architect and professor, Building Anatomy delivers easy access to critical information, to help you:Select structural systems based on the pros and cons of each systemSize and arrange major structural componentsIdentify concerns for each type of structural systemAnticipate probable failure scenariosExplain each system's behavior under loads such as seismic and windUnderstand construction issues encountered during fabrication and erection of each structure typeAnd more!With its critical information, comprehensive coverage, and indispensable illustrations, Building Anatomy delivers the nuts-and-bolts guidance you need to avoid conceptual mistakes during structural design. You can't afford to work without it!